We all know how stressful and tiring it is to study in law school, yet how rewarding it becomes when you finally finish it and get that title that you’ve been sacrificing a whole eight years (at least) for. But the stress doesn’t end there, lawyers continue to study even when they are at work. 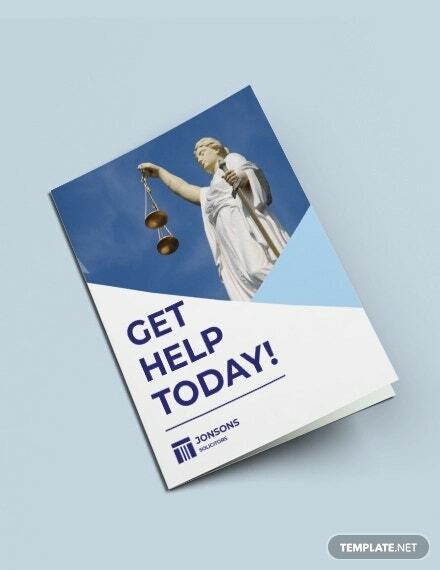 Every client they face have different concerns—some more serious than others—but in order to do effectively what their clients have asked from them, lawyers will need to study their client’s case extensively and find out how they may be able to find a resolution or an upper hand. 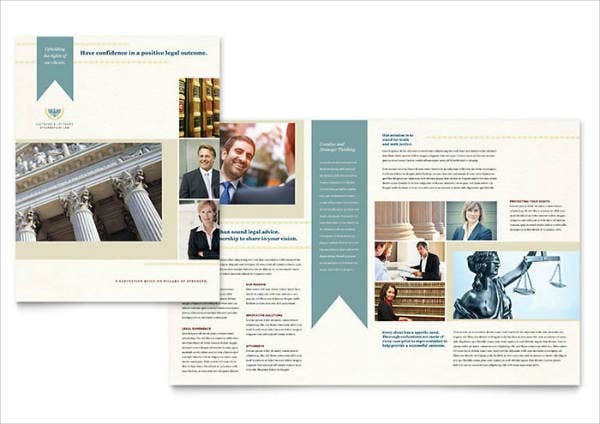 You may also see legal brochure templates. In a similar sense, lawyers have different specializations—some regarding criminal cases while others regarding properties, to name a few—which is why different classifications of legal cases will require a particular type of lawyer. For many lawyers, they would even choose to work together in a single office which they call a firm instead of having to work independently. 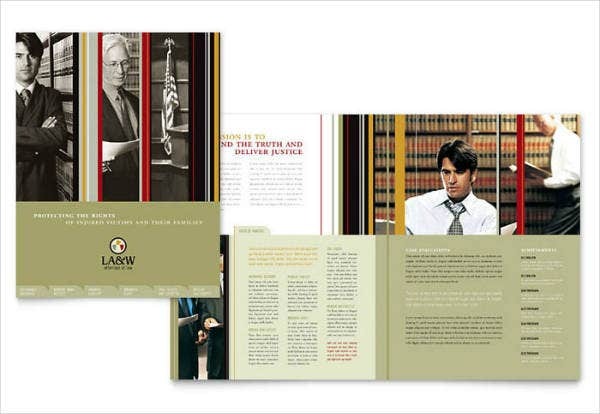 To lawyers who are in need of advertising their services to the public, it would be best for them to make use of brochure examples. This way, people will have something tangible if in case they will need legal services from qualified lawyers. 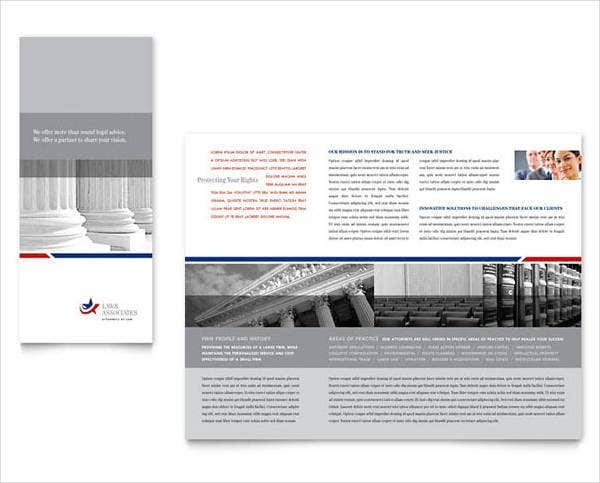 If you intend on keeping your brochure balanced, not only in terms of the fold measurement but also in content, then you might want to use this bi-fold or half-fold brochure template. The graphical and textual elements on this template are highly balanced that it makes the entire design look clean and organized, which is absolutely perfect for the type of industry that it will be used on. However, if bi-fold is too basic for you, then you might want to have your brochures tri-folded. 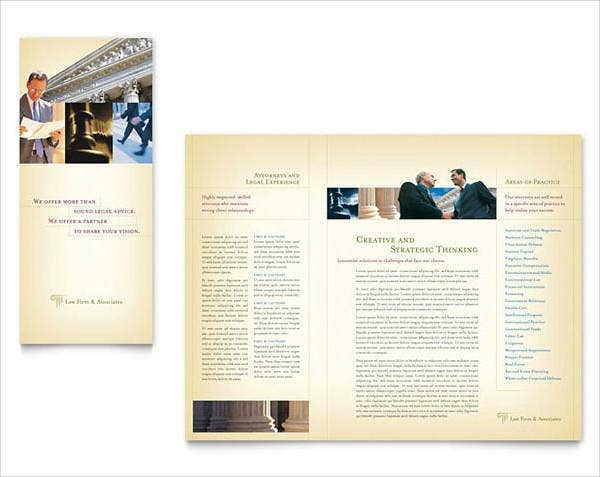 This tri-fold brochure template is perfect for categorizing your content, and you can take advantage on the multiple panels for each category. 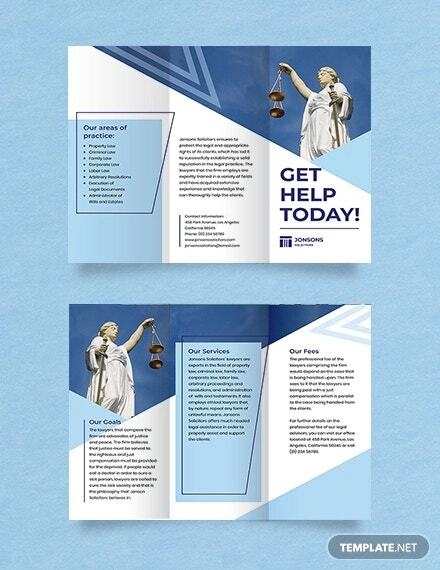 And as seen on the sample design above, you might even want to create a distinctive background color for each content to make the brochure a lot easier to read. How Important Are Brochures for Businesses? For a rather basic and direct explanation, brochures are highly informative tools which are tangible and compact. The great thing about the use of brochures is that they are relatively easy to make and distribute to people, and they are also tangible which make them a lot more impactful than those advertisements that are simply seen on a computer screen. 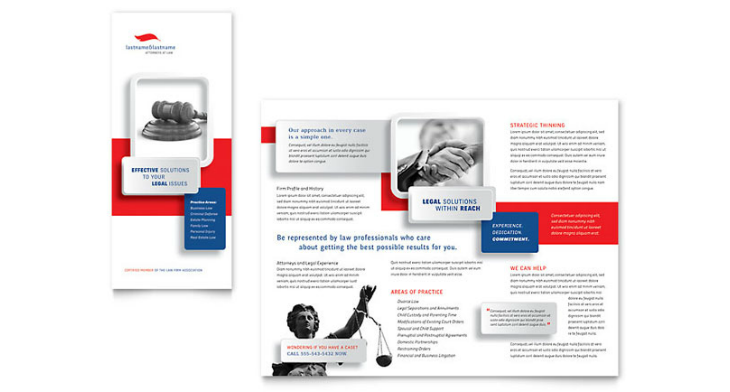 You may also see consultant brochure templates. From the business’ perspective, they can choose whether to distribute brochures by hand or to simply place them on top of counters, tables, or any elevated surface for the people to pick up. Businesses are also allowed to get creative with the design on their brochures and can choose from among the different types that we have mentioned earlier. With this, they can always bring something new and fresh to their prospects. You may also see company brochure templates. In terms of delivering information, brochures are indeed very effective in listing the products and services that the business is offering, to describing how these products and services are able to benefit their clients. Business may even include a testimonial section somewhere on their brochures to tell readers what their satisfied clients have to say about their products and services. 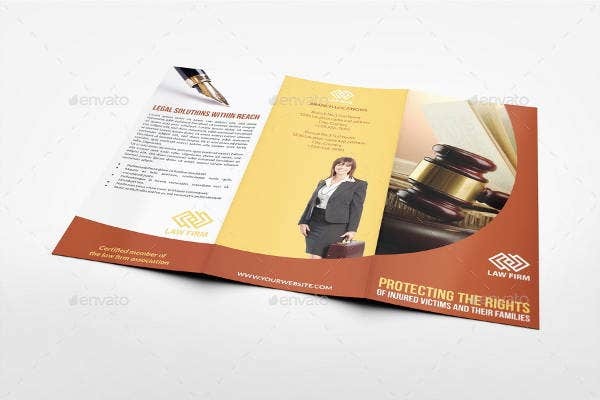 You may also see brochure design templates. And when it comes to expenses, brochures don’t actually cost that much to design and produce, especially if you choose to download our templates, you don’t need to spend a lot. 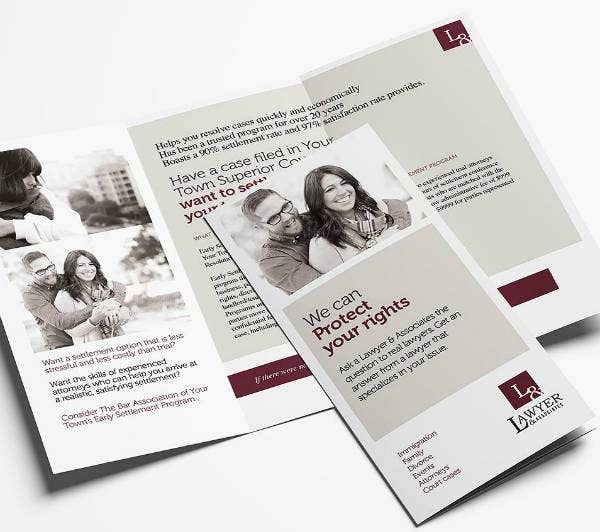 Even if businesses choose to have their brochures designed and printed in third-party printing companies, they are able to make a bargain for each copy if they order more. In short, more copies mean bigger discounts. 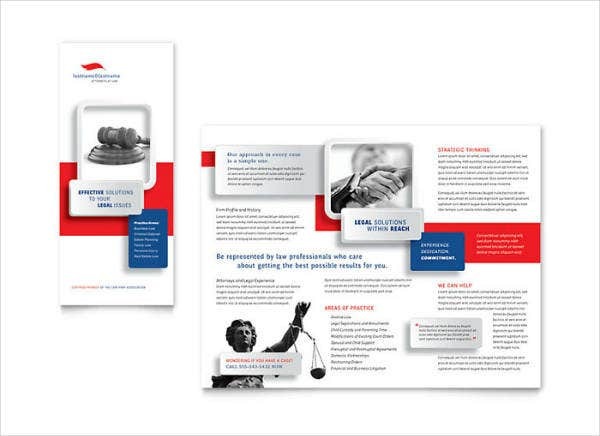 Whether your firm is handling divorce cases, child custody, pre-marriage settlements, child abuse, or agreements with property distribution, you will still need to promote it in order to gather more and more prospects. 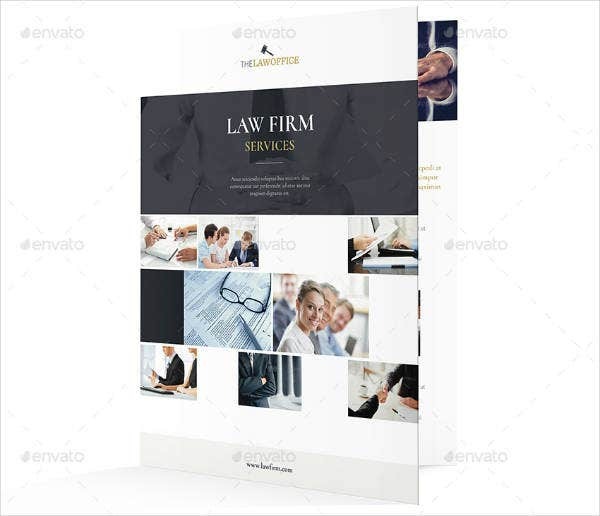 With this law firm brochure template, you can do just that while listing down the services offered by your firm, the lawyers under it and their respective credentials, and the successes achieved by your firm. In relation to this, you may also want to check out our collection of domestic violence brochures. What Are the Different Types of Brochures? And Where Are They Used? Just as we have various brochure layout templates in this article, there are also different types of brochures, each one with their own form and shape. Though the most notable difference when it comes to brochures is the number and the manner in which the paper stock is being folded. Some are folded twice, some thrice, and some are folded towards the same side of the stock while some folded rather differently. Below are some of those different types of a brochure, and we will also be discussing briefly where each type is ideal for use. This type of brochure is probably the simplest to make and most straightforward in terms of delivering information to its readers. Also referred to as bi-fold brochures, this type simply folds the paper stock along the middle to end up with two equal panels on both sides for a total of four usable panels. 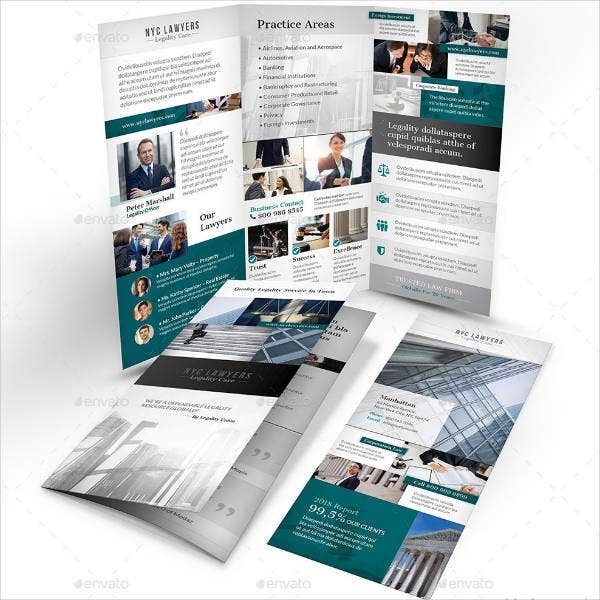 Half-fold, or bi-fold, brochures are perfect for small business presentations wherein the information that is to be conveyed are all direct and specific. From the name itself, this type of brochure has three folds or panels as opposed to the previous one that only had two. Tri-fold, or letter-fold, brochures are actually folded twice which give you three equally-divided panels on both sides for a total of six panels. These brochures are ideal for presentations that have short descriptions or explanations to allow you to maximize the use of each panel. Also, these are great if you intend on making your brochures compact and easy to stuff in your pocket or small bag. This type of brochure shouldn’t be confused with the previous one, though the difference between this and tri-fold brochures is greatly subtle. While tri-fold brochures are folded in a way that it results to three equal panels, gate-fold brochures have a bigger center panel and two smaller ones on the sides in which their edges meet in the middle, thus giving a “gate”-like appearance. Gate-fold brochures are best for presentations that involve a lot of graphical elements which can be placed on the center panels. 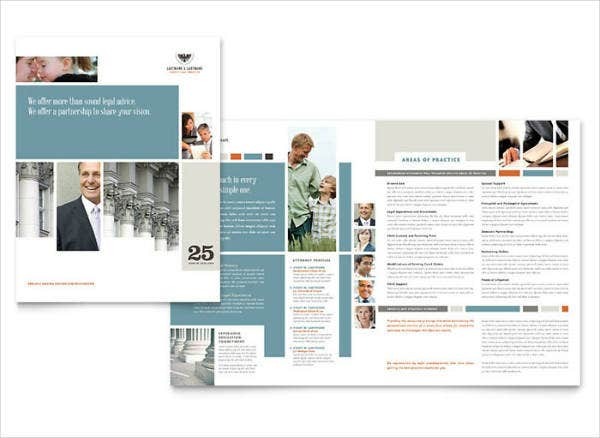 Here is another type of brochure that seldom gets confused with the tri-fold type mainly because of its number of panels. As mentioned earlier, some types of brochures are only distinguishable from the direction in which the panels are being folded, and this is the only difference between this type and tri-fold brochures. As the name suggests, Z-fold brochures look like the letter Z when viewed at a certain angle, and this results when one panel is folded towards one side of the stock, and the other panel is folded towards the opposite side. Z-fold brochures are usually best used for mailing. You can always choose to keep your brochure design simpler and cleaner, which makes it look less cluttered and more presentable. If you like, you may have it in grayscale which allows the graphical elements to blend in effectively with the white space on the design. 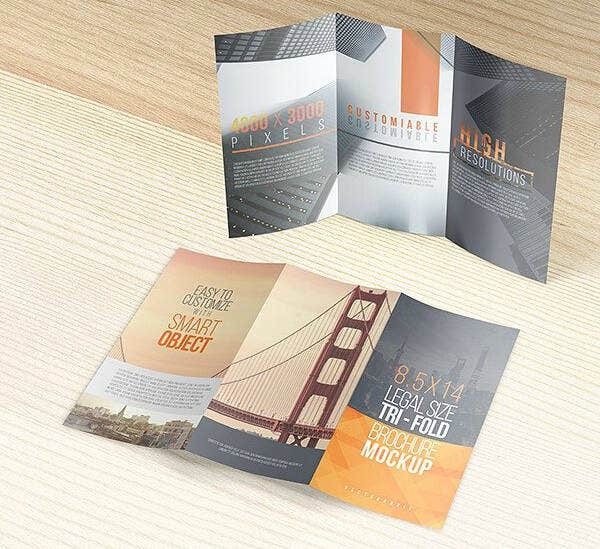 The folded brochure template above might be what you are looking for to achieve that clean and simple design theme that you like. What Are the Different Legal Services? As mentioned during the introduction of this article, lawyers have their own specializations, which means different types of cases call for different lawyers, though they might be able to provide clients with referrals. Below is a list of the different legal services that are being provided by different lawyers in the market. A type of legal service provided in order to save or protect a client from being persecuted. The legal services of a criminal defense lawyer involve defending a person from accusations and criminal charges against them, and to prove them innocent until found guilty by the jurors. You may also see flat design brochures. A type of legal service which focuses mainly on clients who have been charged with DUI—driving under the influence (of alcohol)—or in simpler terms, being intoxicated and then driving. You may also see professional brochure templates. A legal service which determines whether or not a person is legally part of a country. The services here involve protecting immigrants from deportation and taking into consideration their needs. Other than that, these lawyers also assist those students, professionals, and even refugees with their immigration requirements. You may also see creative brochures. A type of legal services commonly sought by business and corporate owners. For a business to be able to function effectively, some guidelines and regulations should be followed, and the lawyers assigned to these services provide businesses with assistance related to those guidelines and regulations. Also, these lawyers are responsible for protecting the interests of the business and overseeing whatever activities are done. You may also see modern brochure designs. Lawyers under this are responsible for any family-related services such as divorce, child abuse, custody of children, pre-nuptial agreement samples, and property settlements between family members or those specified on a final testament. Cases under these services are commonly taken up in the family courts.